Last week we did a two day book binding workshop. It is so much fun to pick out the fabric and paper for the cover. I felt that the design of the fabric (on the left side of the book cover) needed to be broken up just a bit, so I cut out two shapes from the paper (on the right side of the book cover) and glued them on. The shiny reflection on the book is the acetate cover we use to protect them. They take a beating - paint splashes, grass stains, pencil smudges . 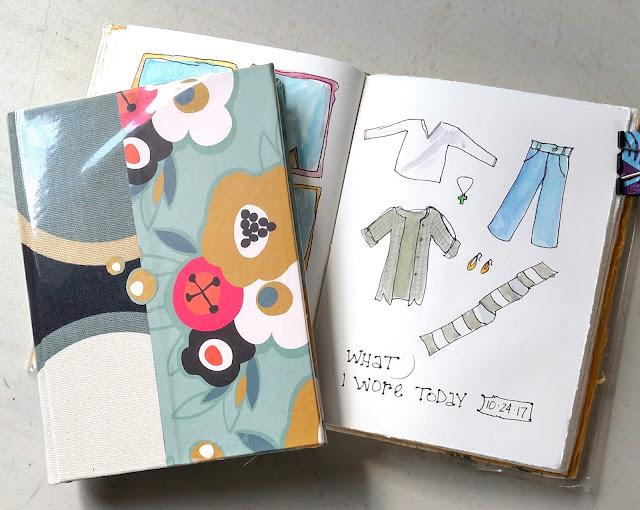 . .
One of the pages we did on day-two was "what I wore today", which is also the homework assignment for my Wednesday and Thursday classes this week. The books made in the class were just beautiful, and the creative participants were such fun to spend two days with. Today I'm watching dark and dramatic clouds over the Bay. The sun in and out of the clouds (mostly in) is doing some interesting things to the colors of the hills across the Bay and the surface of the water - a good day for some color swatches in my journal. Just clicked over to your blog from Pinterest to find a post you had written in 2010. What a nice surprise to see you are still blogging! Your sketchbook pages are delightful. Thanks for continuing to share! Jane - thanks for stopping by, and thanks for the nice comment!